Gettysburg Licensed Battlefield Guide Rich Kohr is standing in front of the Pennsylvania State Memorial which features the Bucktails fight on McPherson’s Ridge on July 1, 1863. This view was taken facing east at approximately 3:45 PM on Sunday, January 10, 2010. In our second post, Licensed Battlefield Guide Rich Kohr showed how the 149th and 150th Pennsylvania Infantry Regiments reformed on the western arm of McPherson’s Ridge to face Brockenbrough’s Virginia Brigade. In our third post, Rich Kohr shows us how the McPherson Barn was attacked, some rock carvings, and revisits the story of the flags of the 149th Pennsylvania. In our fourth Bucktail post, Gettysburg Licensed Battlefield Guide Rich Kohr described how the State colors of the 149th Pennsylvania Infantry were captured on July 1, 1863. In our fifth Bucktail post, Gettysburg Licensed Battlefield Guide Rich Kohr describes how the National colors of the 149th Pennsylvania Infantry were captured, presents the story of Benjamin Crippen of the 143rd Pennsylvania, and shows the final Bucktail, Seminary Ridge positions on July 1, 1863. In our sixth post on the Bucktails on McPherson’s Ridge, we left McPherson’s Ridge to show where some of the Bucktails retreated on Seminary Ridge, and through the town. 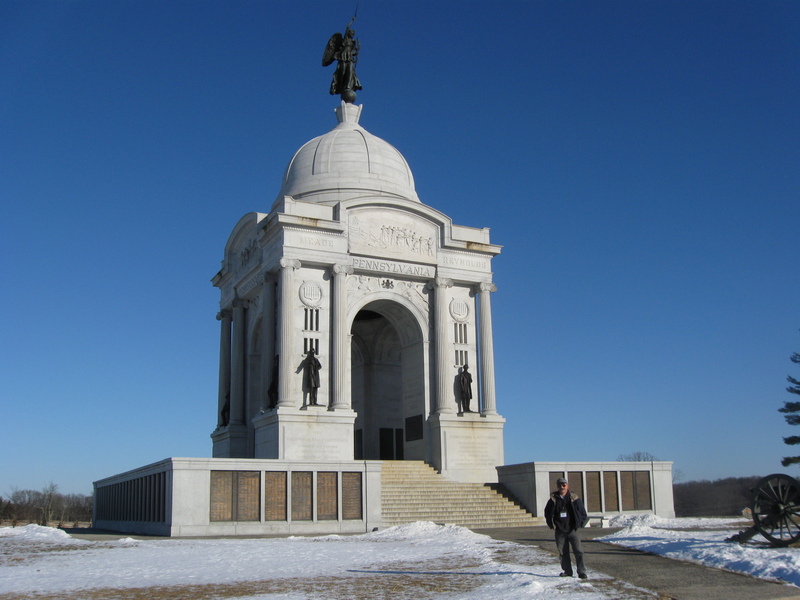 In today’s final Bucktail post, Rich Kohr shows us the bas relief on the Pennsylvania Monument, the Bucktails’ positions on and near Cemetery Ridge, and some Bucktail photographs in the Gettysburg National Military Park Visitor Center. 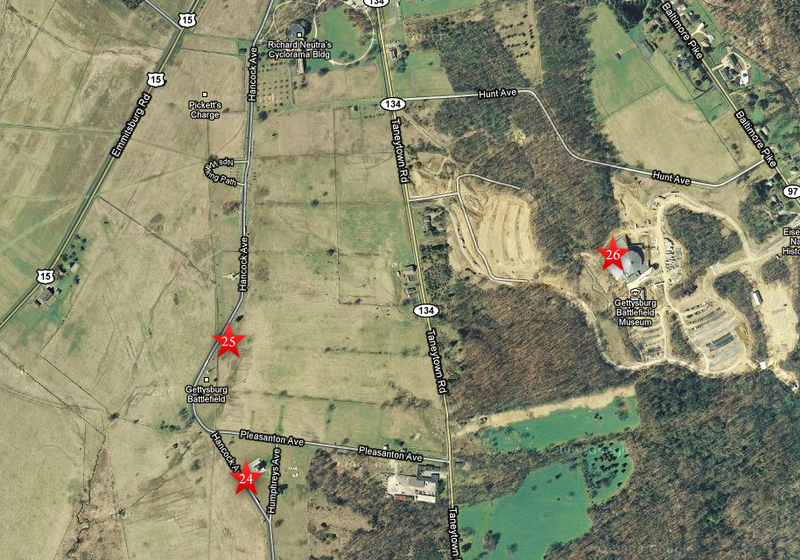 This map shows the locations where our videos were recorded. The number in the star matches the number of the video listed on this post. Videos #1-#23 were taken in our previous Bucktail posts. Video #24 was taken at the Pennsylvania State Memorial. Video #25 was taken near the Cemetery Ridge monument to the 149th Pennsylvania Infantry Regiment. Video #25 was taken inside the Gettysburg National Military Park Museum. This map was made facing north at approximately 6:00 PM on Wednesday, March 10, 2010. 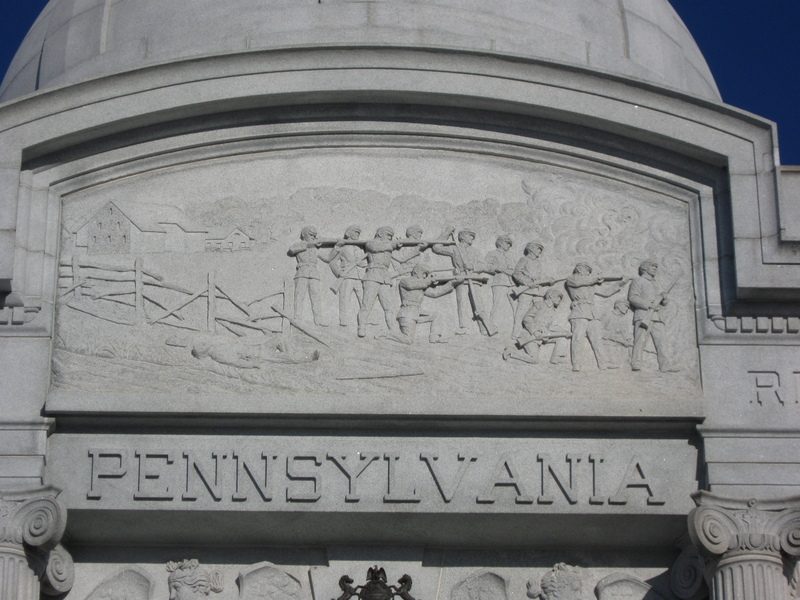 The bas relief on the west side of the Pennsylvania State Monument features the 150th Pennsylvania Infantry Regiment fighting on McPherson’s Ridge, with the McPherson Barn in the left background. This view was taken facing east at approximately 3:45 PM on Sunday, January 10, 2010. In Video #24 (Videos #1-#23 were shown in our previous Bucktail posts) Gettysburg Licensed Battlefield Guide Rich Kohr is standing near the Pennsylvania State Memorial and shows us the bas relief representing Pennsylvania’s Infantry at Gettysburg. This view was taken facing east at approximately 3:45 PM on Sunday, January 10, 2010. 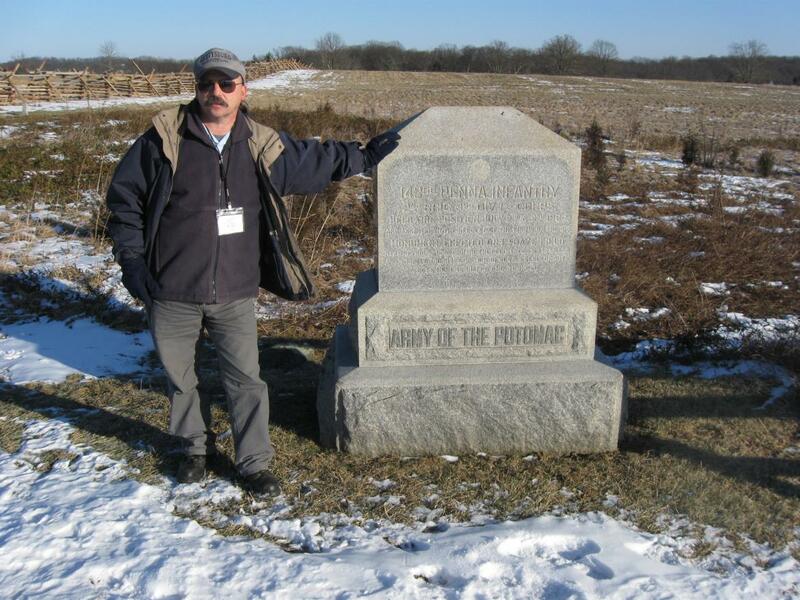 Licensed Battlefield Guide Rich Kohr is standing by the monument to the 143rd Pennsylvania Infantry Regiment, located near Hancock Avenue, on Cemetery Ridge. This view was taken facing east at approximately 3:45 PM on Sunday, January 10, 2010. A closer view of the Cemetery Ridge monument to the 143rd Pennsylvania Infantry Regiment. This view was taken facing east at approximately 3:45 PM on Sunday, January 10, 2010. 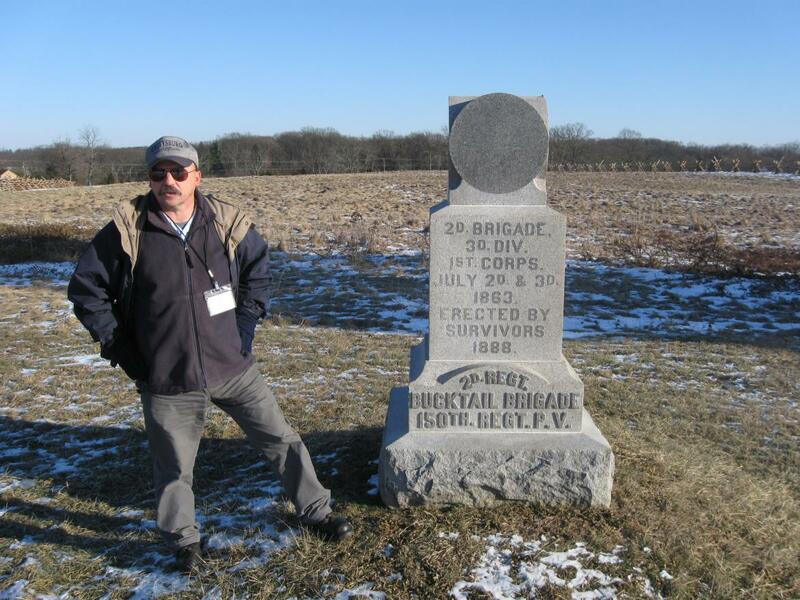 Licensed Battlefield Guide Rich Kohr is standing by the monument to the 149th Pennsylvania Infantry Regiment, located near Hancock Avenue, on Cemetery Ridge. This view was taken facing southeast at approximately 3:45 PM on Sunday, January 10, 2010. 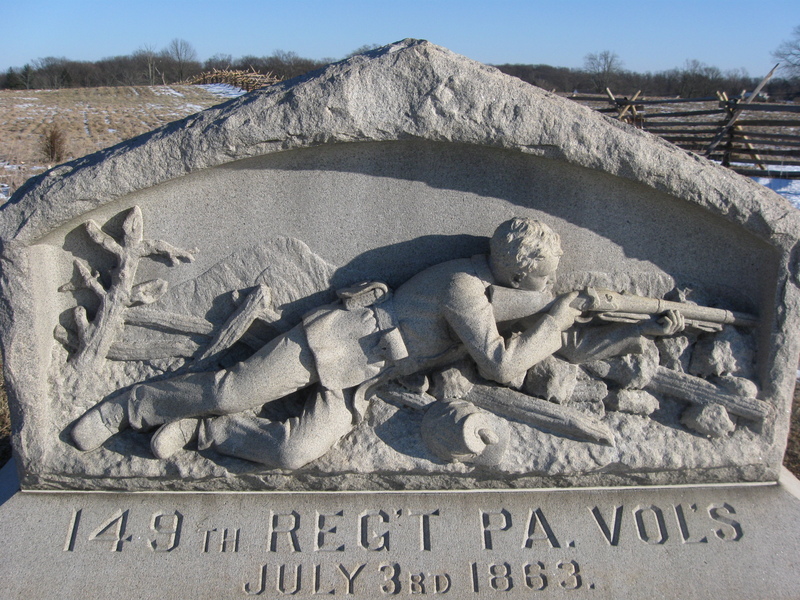 A closer view of the Cemetery Ridge monument to the 149th Pennsylvania Infantry Regiment. This view was taken facing southeast at approximately 3:45 PM on Sunday, January 10, 2010. 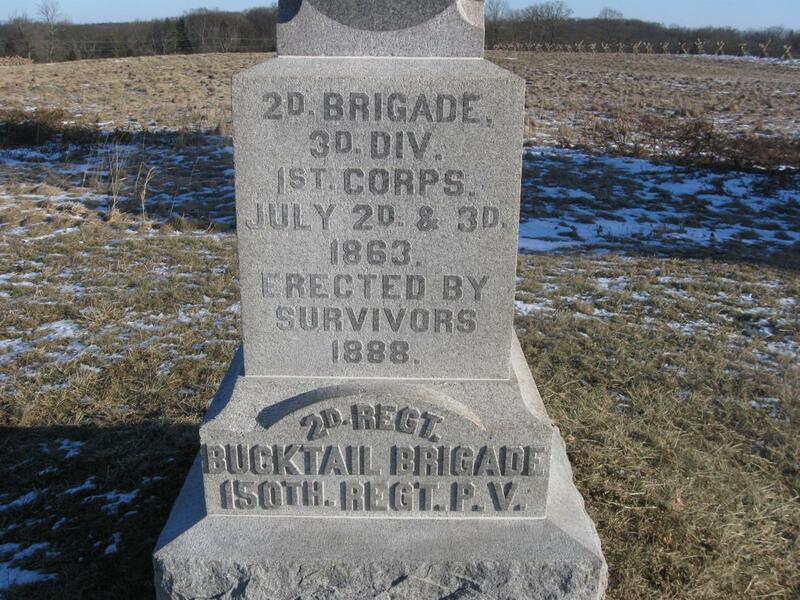 In Video #25 Licensed Battlefield Guide Rich Kohr describes the July 2nd and July 3rd positions of the Bucktails near Cemetery Ridge. This view was taken facing east to north to west to northeast at approximately 3:45 PM on Sunday, January 10, 2010. 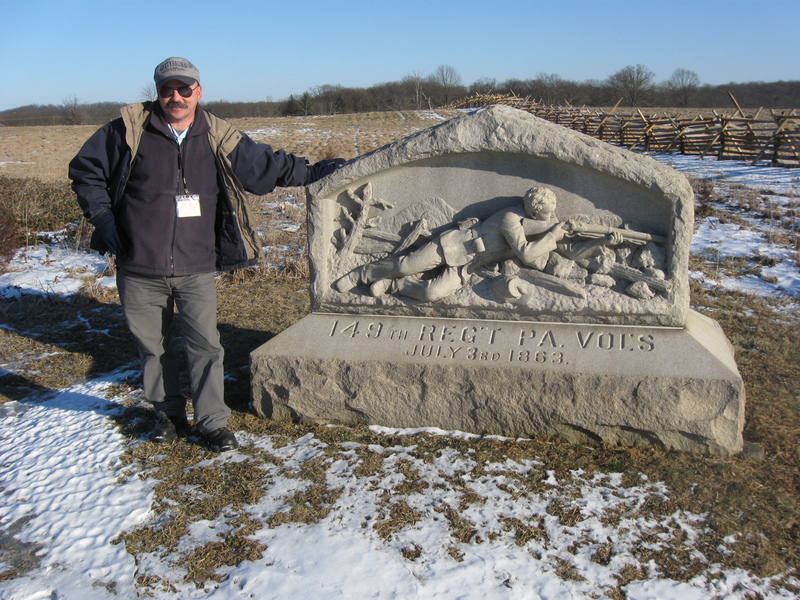 Licensed Battlefield Guide Rich Kohr is standing by the monument to the 150th Pennsylvania Infantry Regiment, located near Hancock Avenue, on Cemetery Ridge. This view was taken facing southeast at approximately 3:45 PM on Sunday, January 10, 2010. 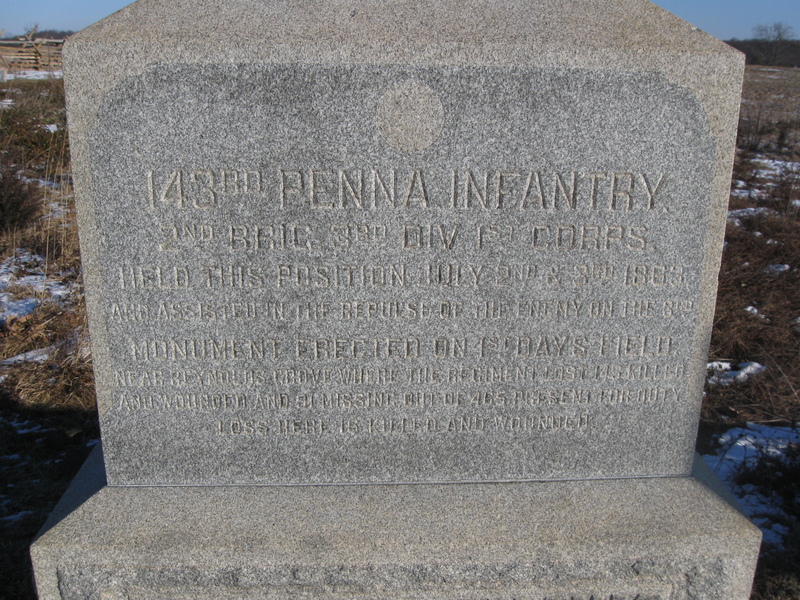 A closer view of the Cemetery Ridge monument to the 150th Pennsylvania Infantry Regiment. This view was taken facing southeast at approximately 3:45 PM on Sunday, January 10, 2010. Rich Kohr is now in the Gettysburg National Military Park Museum. 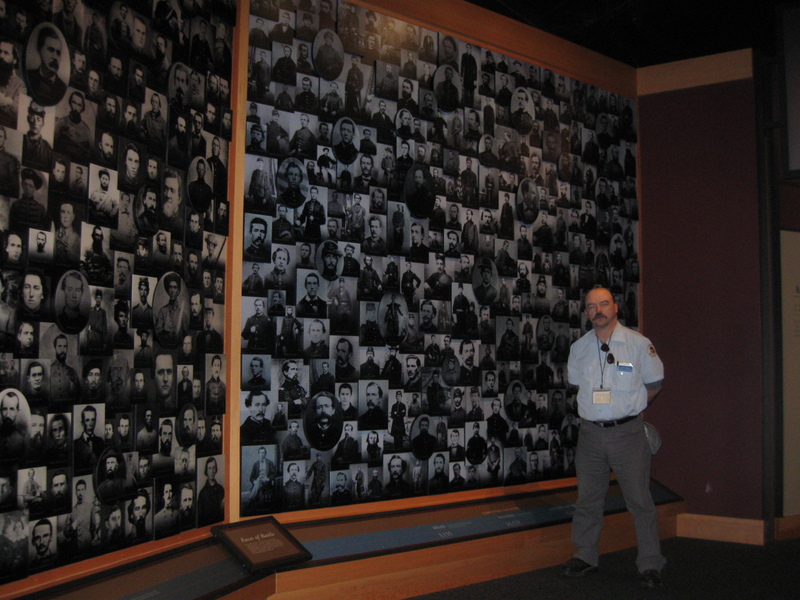 He is standing near the “Faces of Battle” exhibit. This view was taken facing east at approximately 4:00 PM on Sunday, January 10, 2010. In Video #26 Rich Kohr explains why he feels the actions of the Bucktails were important to the Battle of Gettysburg, and he shows us some photographs of the Bucktails displayed in the museum. This view was taken facing east at approximately 4:00 PM on Sunday, January 10, 2010.